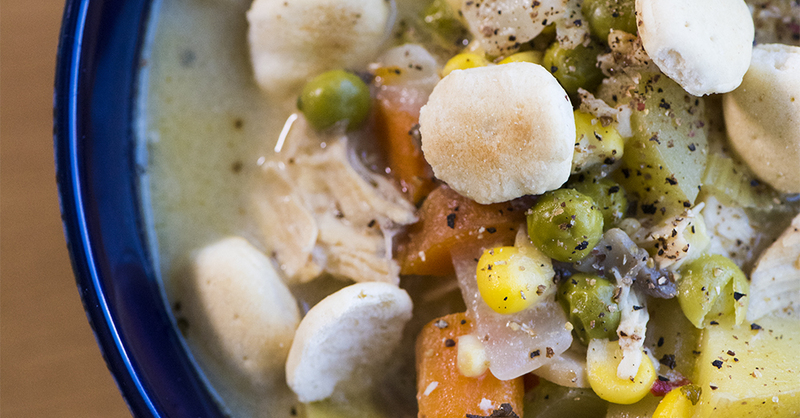 If You Love Chicken Pot Pie, Then You’ll Love This Hearty Soup! Our favorite part of pot pie is definitely the filling; who doesn’t love that rich and creamy mix of tender chicken and veggies? This soup hits the spot when we’re craving a hearty meal, and it certainly warms us from the inside out! We were shocked at how decadent the broth is, considering it’s made with regular milk instead of heavy cream, making it a little more waistline friendly – bonus! To top it off, it’s quicker to make than a traditional pot pie, letting us enjoy all the flavors of the classic dish in a fraction of the time. Make this soup once and it will be an instant family favorite! In a large stockpot melt butter over medium-high heat, and stir in onions, carrots and celery. Saute until veggies start to soften, about 5 minutes, then add garlic and mushrooms and saute an additional 2-3 minutes. Add flour, and stir until evenly combined with veggies, then slowly add in chicken stock and milk, then chicken, potatoes, corn, peas, Italian seasoning, pepper flakes, salt and pepper; stir well to combine. Once soup begins to simmer (not boil!) reduce heat to medium low, cover and continue to simmer 15-20 minutes, stirring frequently to prevent the soup from sticking to the bottom of pot. Once potatoes are tender, remove from heat, serve immediately, and enjoy!